The climate of Corfu (or Kerkyra), a Greek island in the Ionian Sea, is Mediterranean, with mild, rainy winters and hot, sunny summers. The daily average temperature ranges from 9.5 °C (49 °F) in January to 25 °C (77 °F) in August. 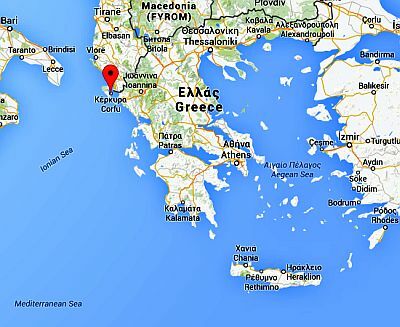 In the interior, there are some hills, whose highest point is Mount Pantokrator, 906 meters (2,972 feet) high. The rains are quite abundant, in fact they amount to 800 millimeters (31.5 inches) per year along the coasts, and even more in the inland hills, and follow the Mediterranean pattern, with a maximum in autumn and winter, while from June to August it almost never rains. Winter, from December to mid-March, is quite mild, even though it is not as mild as on the southern islands of Greece; moreover it is rainy, especially in December and January, when up to 120 mm (4.7 in) of rain fall per month; during some years, the rains are plentiful. However, there is a moderate amount of sunny days. Sometimes there may be outbreaks of cold air from the Balkan Peninsula, with some cold and windy days, and possible slight frosts at night. In inland hills, it can even snow. Spring, from mid-March to May, is mild; the rains are quite frequent at the beginning, but then gradually become rarer, and fine weather becomes more and more frequent. May is a good month, before the summer heat. Summer, from June to August, is hot and sunny: the maximum temperature exceeds 30 °C (86 °F) with some frequency, and can reach 35/36 °C (95/97 °F), especially in July and August; at the worst it can reach 40 °C (104 °F). Luckily, sea breezes blow, providing relief, at least when the heat is not excessive, and in any case, you can cool yourself down in the sea. This part of Greece, overlooking the Ionian Sea, is outside the area where the annoying but cooling Meltemi blows; as a consequence, here the sea is warmer (see below). Autumn, from September to November, is mild (initially even quite hot) and rainy. In September, there may still be many sunny days. The amount of sunshine in Corfu is great in summer, when blue skies prevail, but it is also good in spring, when days with clear skies are already frequent. On the contrary, from October to March there is not much sun, in fact, sunny days alternate with periods of bad weather. The temperature of the sea in Corfu is warm enough for swimming from July to September, while in June it is still a bit cool (22 °C or 72 °F), but all in all acceptable. Here are the average sea temperatures. 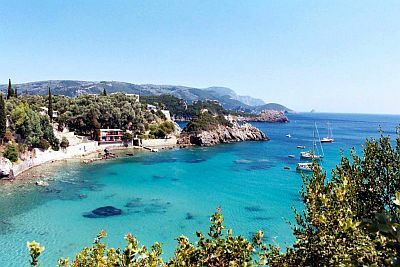 The best time to go to Corfu for a beach holiday runs from June to August, although the weather is often good also in the first half of September. If you plan to go hiking and walking across the island, you can go from mid-April to mid-June in order to avoid the heat that can occur in high summer. Back to the Ionian Islands.